If you’re into boxing, Muay-Thai kickboxing or MMA, then RDX’s Zero Impact G-Core Maya Hide leathered heavy punching bag is JUST for you. Punch bag is double stitched for a longer, durable life that can take on the harshest of punishment. Twinned layer makes this bag untearable and can easily handle 20-24 KG (5ft) 16-20 KG (4ft) approx. producing an ideal amount of sway and resistance. Supplied with free steel chains, swivel & gel bag gloves, heavy gauge welded D-rings can be made heavier depending upon what you fill it with through the convenient zip top design. The tethered loop facility at the base reduces swing for a stable and balanced heavy bag. 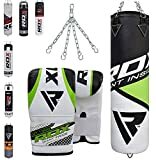 This entry was posted in Fitness Products and tagged Bags, Boxing, Filled, Gloves, Heavy, kickboxing, Punch, Punching, Training by Summer 365. Bookmark the permalink.